Refractive Lens Exchange (RLE) is an advanced form of surgical vision correction in which the crystalline lens of the eye is replaced with an intraocular lens. This procedure is recommended over laser vision correction when patients desire an improvement in both distance and reading vision, have early cataracts, and/or have a high degree of nearsightedness or farsightedness. Dr Raymond Stein is the first surgeon in Canada to use the Catalys™ Precision Laser to perform both Laser RLE and Cataract Surgery in February of 2012. This technology is thought by the ophthalmic community to be one of the most significant advances in eye surgery over the past 50 years. Although Traditional RLE is considered a safe and effective procedure, many of the steps are performed manually, with a blade or needle. Now, with the technological breakthrough of the Catalys Laser™, many of the more challenging steps can be automated, adding unprecedented levels of precision and accuracy to the entire procedure, while potentially making RLE even safer and improving visual outcomes. RLE is offered in cases of very severe near- or farsightedness where LASIK and PRK are less effective. The Bochner Eye Institute is the Official Laser And Eye Centre of the Toronto Blue Jays™ and the Preferred Laser And Eye Centre For The Toronto Maple Leafs™. Q: What tests are necessary prior to refractive lens exchange? Computerized Topography and Ray Tracing – Imaging of both the front and the back of the cornea is performed to determine the total amount of corneal astigmatism and orientation. This information is utilized to determine the best way to reduce astigmatism. Treatment may take the form of laser arcuate incisions, limbal relaxing incisions, and/or a toric implant. Determination of the power of the Intraocular Lens – The IOL Master is the most sophisticated technique to determine the power of the intraocular lens. Drops are not required and nothing touches the eye. This test measures the curvature of the front of the eye and length of the eye. This information is entered into a computer formula to calculate the power of the lens. Q: What choices to I need to consider prior to surgery? A: You need to choose between Laser RLE Surgery or Traditional RLE Surgery. You also need to decide if you prefer the best distance vision and a pair of reading glasses (Custom Vision Package), or potential freedom from glasses for distance, intermediate, and reading (Advanced Vision Package). Q: How is laser refractive lens exchange performed? Dilating and anesthetic drops are instilled into your eye. In the Catalys™ Laser Suite, under 3D imaging, the following automated procedures are performed: a circular opening in the crystalline lens, fragmentation of the lens into tiny pieces, and laser arcuate incisions in the cornea to reduce astigmatism. In the Lens Extraction Suite, your eye and lids will be cleaned with a disinfectant solution. A paper drape, with a small opening for the eye, will be placed over your head and body. A small speculum is used to keep your eyelids from closing. An aspirating device is used to remove the fragmented crystalline lens. In 90% of eyes no ultrasound energy is required. A thin membrane referred to as the capsular bag is left intact. An intraocular lens is folded and inserted through the micro-incision into the capsular bag. An antibiotic is placed into the eye to prevent infection. You will be brought to the recovery room where you will rest before being discharged. Q: How is laser traditional lens exchange performed? Astigmatism may be corrected with limbal relaxing incisions by a handheld blade. Higher degrees of astigmatism are corrected by a Toric implant. Micro-incisions are created with a hand-held blade in the periphery of the cornea. A circular opening is made by hand in the anterior portion of the crystalline lens. An ultrasonic probe that vibrates rapidly (40,000 times per minute) is used to liquefy the lens. An aspirating device is used to remove the contents of the lens. A thin membrane referred to as the capsular bag is left intact. An intraocular lens is folded and inserted through the peripheral corneal incision into the capsular bag. Q: What do I need to know after my surgery? A: You may return to your normal activities provided they are not strenuous within a few days of the surgery. Prescription for eye drops (antibiotic and steroid) to be used for 4 weeks. Protective eye shield should be worn at bedtime for 5 nights. You may wash your face and take a shower but avoid getting water in your eye during the first 2 weeks. Avoid lifting more than 20 pounds during the first 2 weeks. Q: What are the potential complications of Refractive Lens Exchange surgery? Infection in the eye (1 in 10,000). This usually requires emergency surgery and additional antibiotics. This can result in loss of vision. Dr. Stein has not had a case of an intraocular infection in over 20 years. Swelling of the back of the eye (1 in 500). This usually resolves with drops. 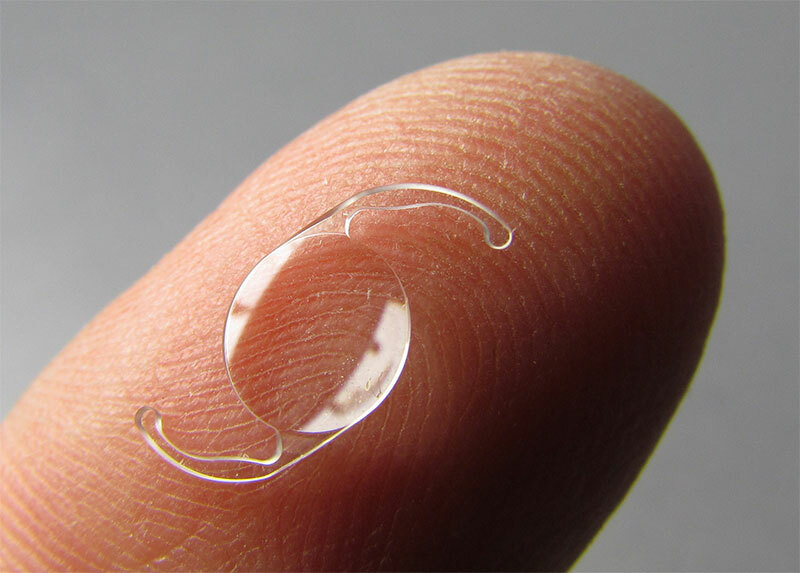 Unable to remove the crystalline lens with one operation (1 in 1,000). A second operation is required. Retinal detachment is more common in patients that are highly nearsighted. In general this occurs with a frequency of 1 of 1,000 eyes. Surgery is required to reattach the retina.